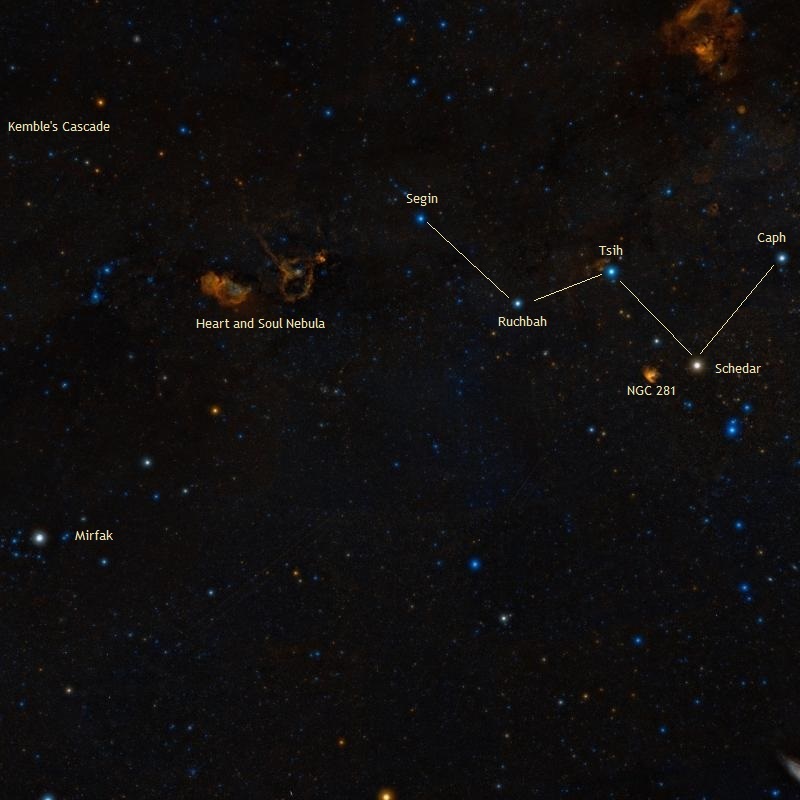 Kemble’s Cascade, or Kemble 1, is an asterism located in the northern constellation Camelopardalis, the Giraffe. The asterism is formed by more than 20 faint stars arranged in a straight line over a distance approximately equal to five moon diameters. The celestial cascade points in the direction of Cassiopeia constellation. 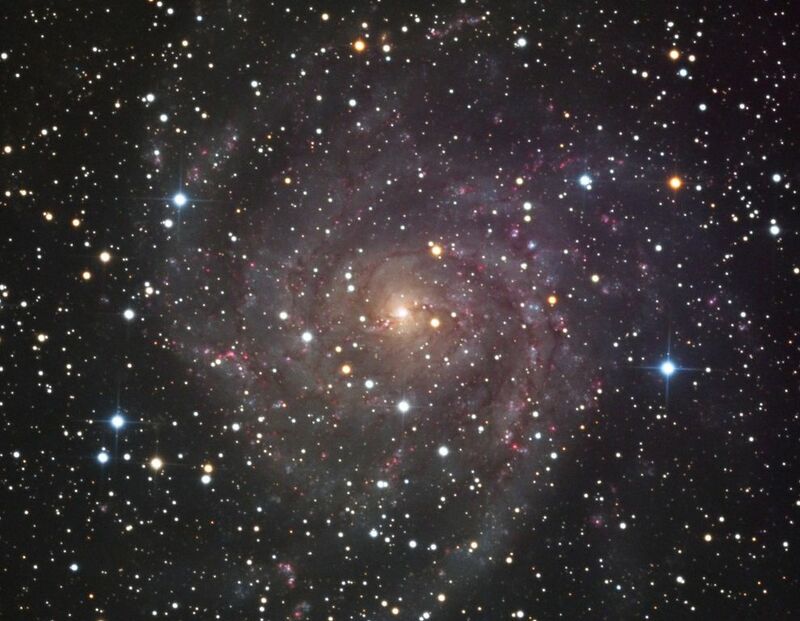 It contains a brighter, 5th magnitude star near the middle and ends with the small open cluster NGC 1502. The stars in Kemble’s Cascade range from 5th to 9th magnitude in brightness and the asterism is easy to see with binoculars. 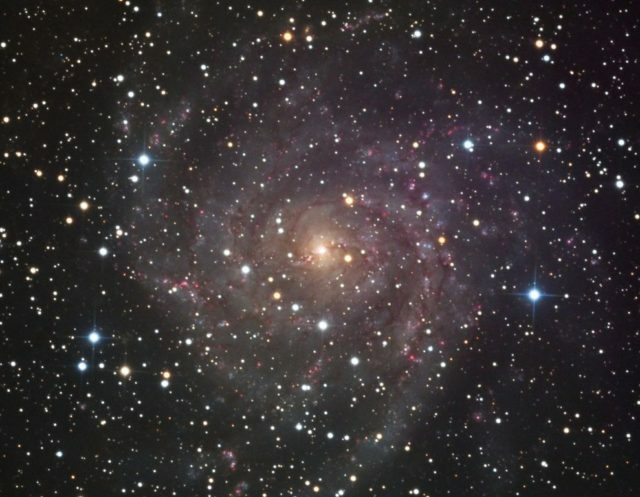 More than a dozen stars are visible in 10×50 binoculars and the cluster NGC 1502 appears as a fuzzy patch of light. Camelopardalis is a relatively faint constellation, with only four stars brighter than magnitude 5.0 and none shining brighter than 4th magnitude, but the asterism can be found using the bright stars that form Cassiopeia’s W. It lies about 10 degrees east of the W, in the same region of the sky as the Heart and Soul Nebula and the face-on spiral galaxy IC 342. The Oyster Nebula (NGC 1501), a complex planetary nebula discovered by William Herschel in 1787, can also be seen near the asterism, in the vicinity of the open cluster NGC 1502. The brightest star in Kemble’s Cascade is HD 24479, also known as HR 1204 or H Camelopardalis. The star has an apparent magnitude of 4.95 and lies at a distance of 338 light years from Earth. It is a blue dwarf with the spectral classification B9.5Ve. Kemble’s Cascade was named after Father Lucian Kemble, a Franciscan friar and amateur astronomer, who spotted the asterism while observing the sky with his 7×35 binoculars from Alberta, Canada. Kemble wrote about the discovery to Walter Scott Houston, who wrote the popular monthly column “Deep-Sky Wonders” in Sky and Telescope magazine from 1946 to 1993. Kemble described the asterism as “a beautiful cascade of faint stars tumbling from the northwest down to the open cluster NGC 1502.” Houston wrote about the asterism in his column, referring to it as Kemble’s Cascade, in December 1980. NGC 1502, the small, relatively compact open cluster that Kemble’s Cascade appears to “flow” into, consists of about 45 stars and has a visual magnitude of 6.9. 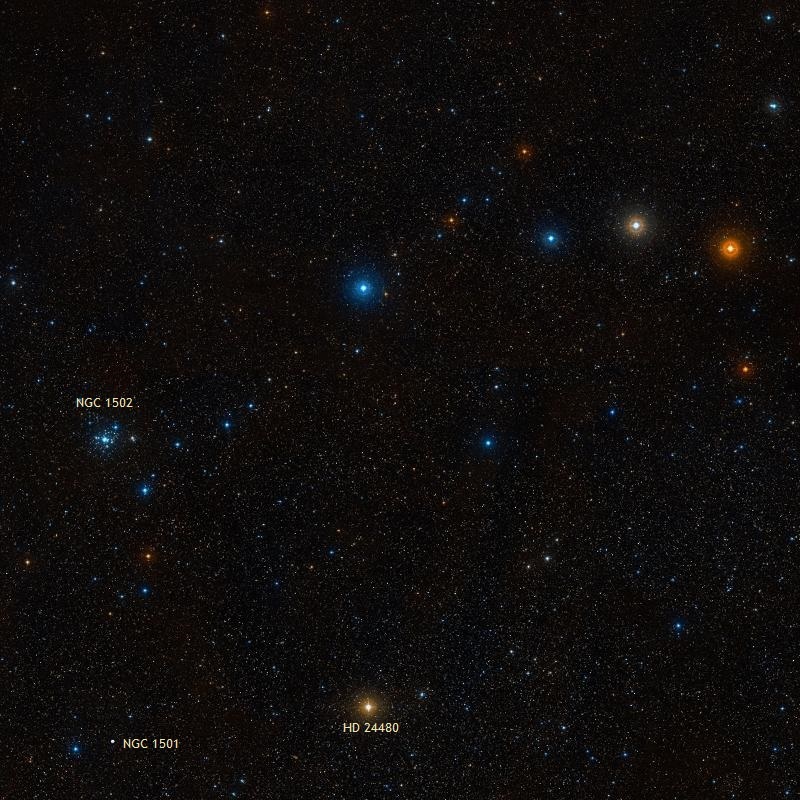 The cluster occupies an area 20 arc minutes in size and lies at a distance of 2,700 light years from Earth. At its center lies the binary star Struve 485, a system that consists of two 7th magnitude stars separated by 18 arc seconds. 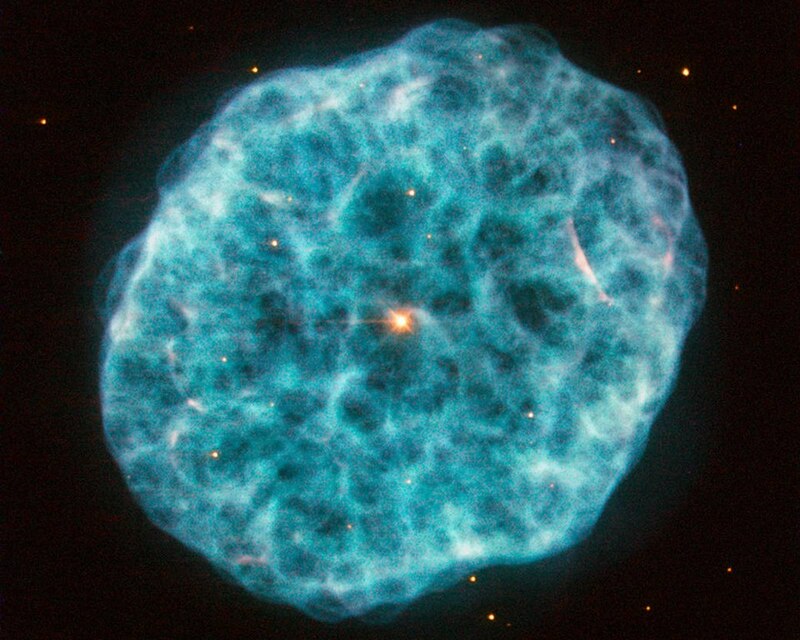 NGC 1502 was discovered by William Herschel on November 3, 1787.